Candace Thomas decided she would do anything to keep her baby. She did everything she had to do to get off the streets, to conquer her addictions, and have a healthy baby, but she couldn’t do it alone. Bissell Centre’s Childcare Program was there to give her the support she needed to be successful. A year ago, Candace worked hard with a few agencies. She attended 12 step meetings, found a sponsor, attended more meetings and did everything she could in order to keep her daughter. Now she lives in a house of her own. She has successfully completed treatment for her addictions issues and continues to work on building a new life with her daughter. She brought her now four-month-old daughter Oskiah with her to our interview. Oskiah is a healthy, happy baby who spent the entirety of our interview laughing and cuddling with her mother. Candace also looks happy and healthy, and takes every opportunity to bond with her baby. Between questions she holds Oskiah up to look into her eyes and tickle her chin. 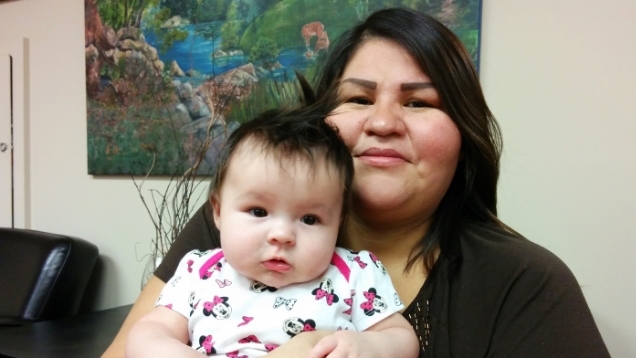 Crucial to her success in this new life, Candace says, is Bissell Centre’s Childcare Program. Team Lead Fatima Bellahmer and the other child care workers put in special care and attention that she says has been an invaluable aid. Candace appreciates having staff and other parents she can go to with questions, be notified of other opportunities in the community, and otherwise find friendly support. This story is from our March 2015 newsletter, which can be viewed in full here, with other great articles for you to enjoy!